Ausländer können ohne Risiko ein Haus kaufen und besitzen in Thailand! Ein Ausländer der nach Thailand kommt kann jede Art von Gebäude in ihrem Namen nach thailändischem Gesetz beim örtlichem Grundbuchamt als Eigentümer eintragen lassen. Ob das Haus gebaut ist auf ein rechtlich gepachtetes Grundstück oder auf ein Grundstück dass auf den Namen ist vom thailändischen. Weitere Informationen finden Sie unter "Wie Baugrund zu kaufen" in unserer Website. Besitz von Land und Haus ist als Eigentümer des Hauses gesichert. Der Rechtsanwalt hat im Land-Mietvertrag bereits bestimmt das Haus vom Land getrennt ist und kein Bestandteil ist vom Grundstück im Rahmen des Zivilrechts. Eigentümer von Gebäuden ist registriert beim örtlichem Grundbuchamt und der Vermieter vom Grundstück kann vor Ablauf des Mietvertrags kein Anspruch auf das Haus machen. Nachweis des Eigentums ist entweder die Baugenehmigung oder das unterzeichnetes Kaufvertrag. Wenn das Haus fertig ist, werden Sie als Besitzer des Hauses bei den lokalen Behörden registriert und überreicht Ihnen ein gelbes Buch -Kor Ror 13- . …………………………………………………… here in after called “BUYER”. Constructor will construct a teakwooden house, model and details as on appendix A (... pages). The house will be partly pre-constructed in constructor’s factory, there-after it will be de-assembled and transported to the final location, ……………………. The appendix A (... pages) is deemed as an integral part of this contract. The construction will start within 2 weeks after receipt of first payment at your land and at constructor’s factory and will be ready for shipment to …………………. within 2 month after construction has started. 20% when the foundation at buyer's land is ready. 20% when structure is ready. 15% when roof is ready (roof-tiles will be placed at final location). 10% when the house is ready to be transported to final location. 10% after the house is finished and approved by buyer. Constructor agrees to guarantee the work for 1 year after the house is completed. The Constructor agrees to be responsible for tools, equipments, machines, accessories, including materials and devices having quality adequate to work , including the quality of labors which appropriate to the hired work in order to complete all jobs within the due. 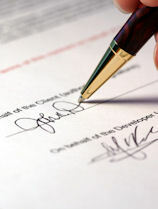 Each clause of the contract is independent. Should any part of the contract be ineffective, it should be deemed that other parts are still effective. This contract shall be interpreted by the Laws of Thailand. The courts of Thailand shall have exclusive jurisdiction in the event of any dispute out of this contract.